Formalin-fixed tissue samples are a challenge for RNA and DNA extraction, often resulting in low yields and poor performance in subsequent steps. Most existing methods rely on heat to remove crosslinks and adducts, which is only partially effective and leads to additional fragmentation of labile nucleic acids. In contrast, the catalytic CAT5™ technology, built on research initiated at Stanford University (Ref. 1), greatly accelerates the removal of formaldehyde damage and allows recovery of higher quality nucleic acids. 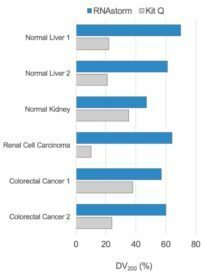 This results in higher yields, more intact RNA or DNA, and better results in downstream analysis like PCR, microarray, or next-generation sequencing (NGS). 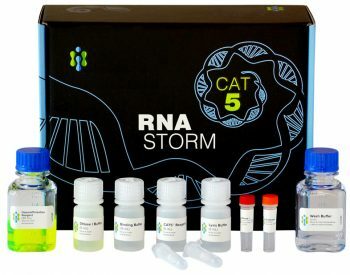 Powered by proprietary CAT5™ technology, the RNAstorm™ FFPE extraction kit enhances the removal of formaldehyde-induced damage and purifies RNA with higher yield and quality, better integrity, and greater amplifiability. 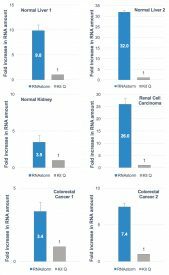 The superior quality of RNAstorm-derived RNA has been demonstrated in many ways, including higher RIN score (Fig. 1), higher yield (Fig. 2), higher DV200 (Fig. 3), and improved RNA-seq alignment. According to a tech note from Illumina (Ref. 2), the best predictor of successful performance in Illumina RNA-seq is the DV200 score, which represents the percentage of RNA fragments longer than 200 nucleotides. Whether you are performing RNA-seq, RT-qPCR, microarray, or other gene expression analysis, the RNAstorm™ kit is your best chance for success. Using the same CAT5™ technology as the RNAstorm™ kit, the DNAstorm™ FFPE extraction kit enhances the removal of formaldehyde-induced damage and provides DNA with higher yield, quality and greater amplifiability. The DNAstorm™ kit is the best solution for NGS, qPCR, and other advanced DNA analysis applications. Figure 1. 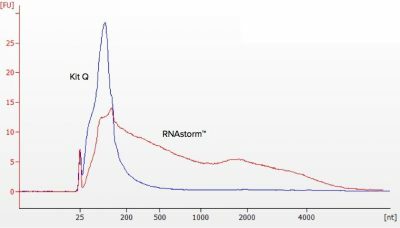 Increased RNA integrity is observed for RNA extracted using the RNAstorm™ kit compared to a popular commercial kit. Extracted RNA was analyzed on an Agilent Bioanalyzer RNA 6000 nano. Figure 2. 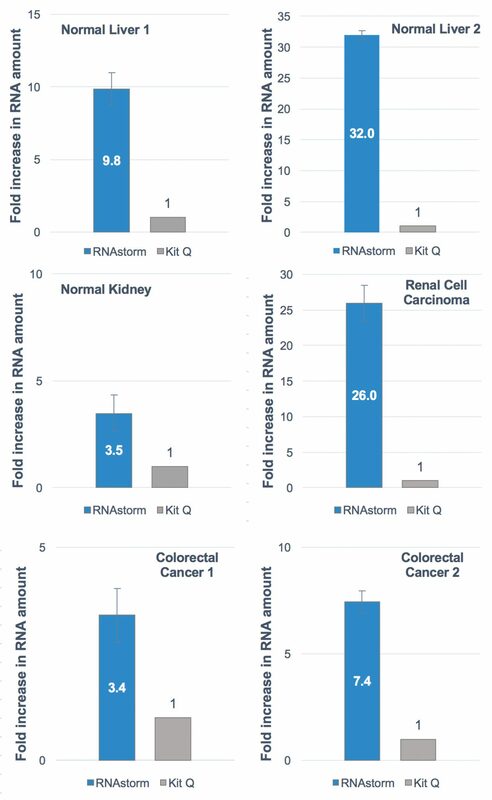 Comparison of RNA recovery by quantitative RT-PCR from six different FFPE tissue samples. “Kit Q” represents a market-leading competitive commercial FFPE extraction kit. 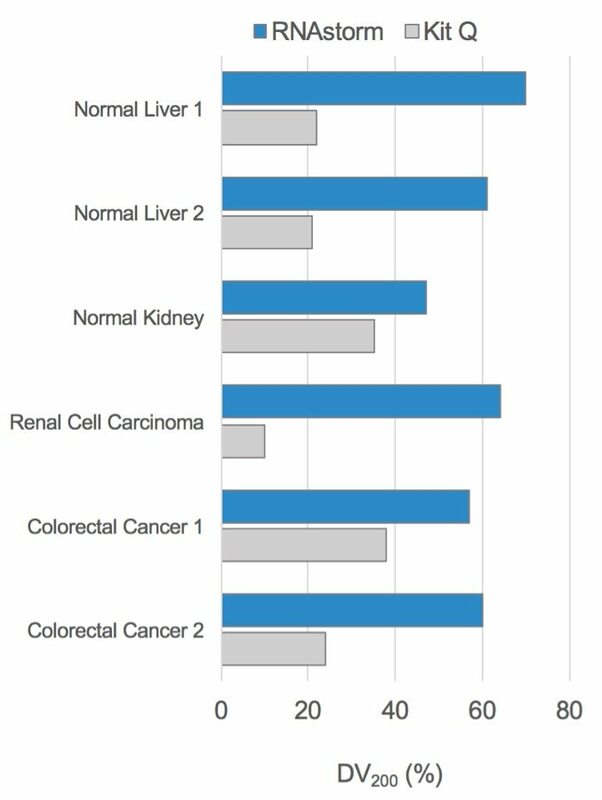 Relative amounts of RNA were estimated from the Ct number observed for each sample. Figure 3. 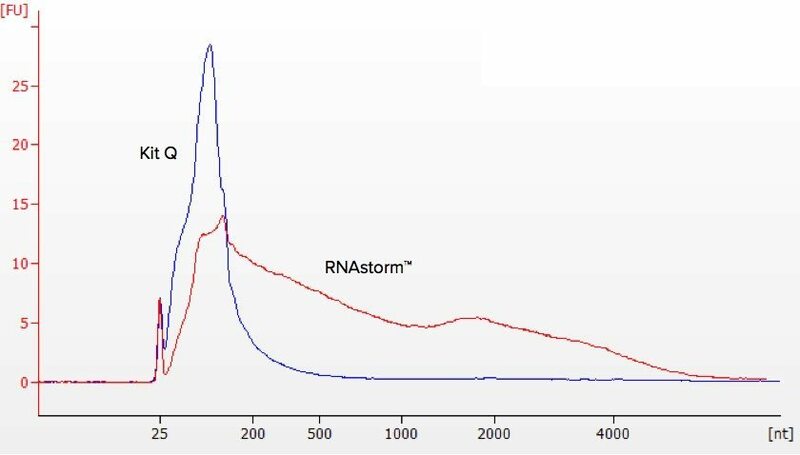 RNA extracted using the RNAstorm™ kit was compared to a popular commercial kit. Increases in DV200 (the percentage of RNA with length > 200 nt) were seen for a variety of tissue samples. Biotium’s DNA Gel Extraction Kit is a silica-gel spin column based DNA extraction kit designed to purify 40 bp-40 kb DNA fragments from agarose gels in TAE or TBE buffer. Each column has a maximum binding capacity of 10 ug DNA. Biotium’s DNA Gel Extraction Kit removes GelRed™ and GelGreen™ Nucleic Acid Gel Stains, along with other commonly used nucleic acid gel stains. The purified DNA is compatible with common downstream applications such as transformation, sequencing, PCR, and restriction digests.